This chart shows the change in active users for the top 20 global social networks (excluding China). Respondents were asked the question 'Which of the following services have you used/contributed to In the last month?". Facebook-owned photo sharing service Instagram showed the biggest increase over the period with 23%. 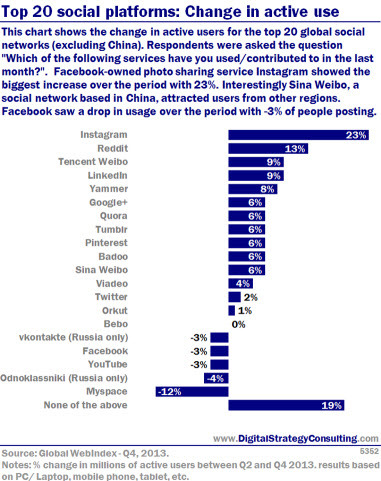 Interestingly Sina Weibo, a social network based in China, attracted users from other regions. Facebook saw a drop in usage over the period with -3% of people posting.